Whenever I get together with my friend Lisa, we spend much of our time hanging out in the kitchen, cooking, eating and laughing. Lisa is an adventurous eater and enthusiastic cook. She’s the one who introduced me to Ethiopian food and soft shell crabs. We’ve shared summer pudding in East Berlin, lobster straight out of the steamer at a beach house in Delaware, and southwest paella cooked over a backpacking stove in Yosemite. Ours is a bi-coastal friendship and we don’t see each other as much now that we no longer work in journalism. 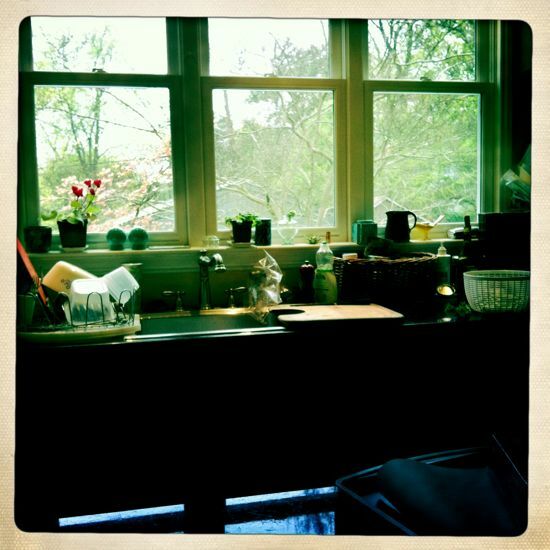 But when I flew back to Maryland to visit her last month, we picked up right where we left off, drinking tea in the remodeled kitchen of her Victorian house and planning our meals for the week. 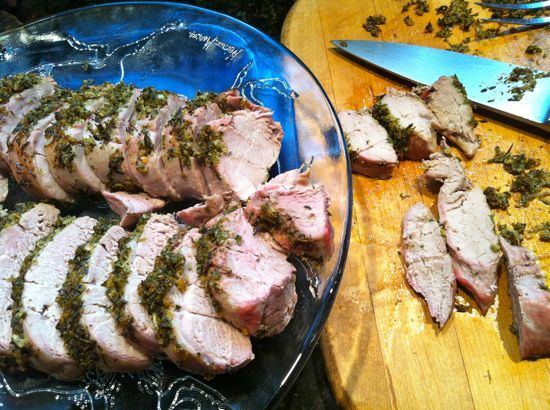 This pork roast came from a dinner party we threw for a few of Lisa’s close friends. It started with a pair of tenderloins pulled from the freezer and a garlicky herb paste, originally devised for chicken, we adapted from an Italian cookbook. It was such a hit, I knew right away that I would post it here. Tenderloin is a juicy–and yes, tender–cut that cooks quickly and pairs well with many flavors. Because it’s so lean, though, you have to be careful not to overcook it. The internal temperature will continue to rise while it rests after roasting, so pull it out of the oven when it reaches 140 to 145 degrees. A thick blanket of minced herbs, garlic and lemon zest, inspired by “Big Night In” by Domenica Marchetti (Chronicle, 2008), keeps this roast moist even if you do cook it a tad too long. We introduced fennel fronds to the mix for a lingering note of anise, which goes so well with pork. The proportions aren’t that important. Just hold back a little on pungent herbs like rosemary. The recipe is simplicity itself. Mince up a couple of handfuls of mixed herbs with garlic, spices and olive oil. Slather the mixture over the tenderloins and let them marinate 4-6 hours, or overnight if possible. Slide them into the oven and bake for 15-25 minutes. Let them rest while you set the table and toss the salad. Then serve. Party fare doesn’t get any easier than this. On a cutting board or in a small food processor, mince together herbs, garlic, sea salt, chile flakes, pepper and lemon zest until well blended. Place in a small bowl. Stir in olive oil to make a thick paste, using more oil if necessary to get a spreadable texture. Cut short slits about 1/2-inch deep all over the tenderloins. Spread herb paste over the surfaces of the meat and massage into the slits. Cover with plastic wrap and refrigerate 4-6 hours or overnight. Remove pork from refrigerator and allow to come to room temperature while you preheat the oven to 425 degrees with a shallow roasting pan on the center rack. Place tenderloins in the hot pan, close oven door and immediately reduce heat to 400 degrees. Roast for 15 minutes and begin checking internal temperature of meat with an instant-read thermometer at 5-minute intervals. Remove meat from oven when the temperature reaches 140-145 degrees. Cover lightly with foil and let rest for 10 minutes while you finish preparing the meal. Slice meat into 1-inch thick medallions and serve. OH OH OH!! My husband is gonna love this. Do you know the proverb that says the way to the man’s heart is his stomach. Well, this is exactly the case of my husband. Thank you very much for all the nice recipes.